Commercial Roofing Renovation | Old Dominion Roofing & Construction. Commercial and Industrial Solutions "Serving Virginia Since 1984"
Commercial Roofing Renovation fixes and maintains an existing roofing system. It can be done under certain conditions to avoid an complete roofing tear off. Roofing renovation is a process of restoring a roofing surface to like new conditions. This is a process that does not require a complete need for re-roofing and reduces the cost, mess and time that otherwise a new roof would. Our commercial roofing renovation experts will offer you informed options based on your budget and needs. You’ll want the best and most cost effective products available for your roofing renovation. Old Dominion Roofing & Construction, Inc has diverse knowledge of the best products for a roofing renovation. Repairs are necessary to maintain an existing commercial roofing systems. Weather, UV, storm damage and time challenge any roof integrity. Our commercial roofing experts will inspect, locate and repair your damaged roof quickly. You can depend on us to respond as quickly as possible to repair your roofing in case of an emergency. 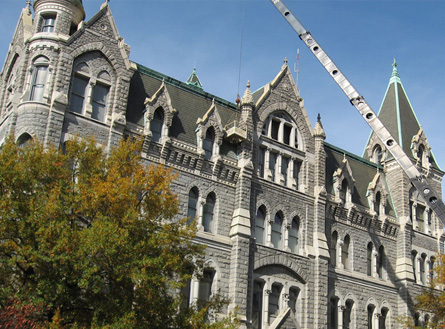 We have been installing low-slope (flat roofing) across the Virginia region to include; Warehouses, Public Libraries, K-12 schools, Correctional Centers, Armorys, Condominiuns, Municipal buildings, Historical Structures to name a few. We understand the complexities of providing the absolute best in industry commercial roofing installations, while ensuring minimal to no impact on your daily operations. Old Dominion Roofing & Construction, Inc. is your roofer of choice for commercial roof replacement services. Old Dominion Roofing & Construction, Inc. was established on April 17, 1984, specializing in Flat Roofs for the Industrial and Commercial Industry. We pride ourselves on service and quality workmanship. We service, repair and install a variety of systems including: Built Up Roofs (BUR) using Coal Tar Pitch or Asphalt, SBS Modified Bitumen, APP Modified Bitumen, EPDM, PVC, Standing Seam Metal, Slate, Shingles and Gutter & Downspouts.